There is an old saying “it is not over until the fat lady sings”, and in this case, your gambling experience is never over until you play “Fat Lady Sings”. This video slot is a highly entertaining slot machine that has all what it takes to be one of the best slots ever made. It is powered by Microgaming, it is offered in great visuals and sound effects and it has an amazing set of rewarding features and symbols. 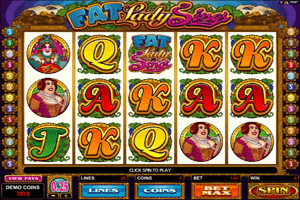 Play Fat Lady Sings Slot here. The game is themed around an Opera, this is why all of the symbols and the visuals of the slot are inspired by such theme. The icons that spin on the 25 lines and the five reels of the game include the Fat Lady as well as other opera performers plus poker card symbols. Bets are placed at the bottom through the control panel of the game. This panel contains multiple betting options, these options are the number of coins players will to place on the lines, the number of lines and lastly, the value of the coins that they want to use to make those bets. The Scatter Opera masks are bonus symbols as they can trigger free spins, multipliers as well as cash prizes. All what players need is to get 3 of these symbols at least on the reels of the game so they can trigger the bonus round and earn rewards. The logo of the game acts as a wild icon.